It's hard to beat the old fashioned kid's birthday party ideas. Enter the Skate Party. 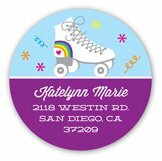 Looking for roller skating party ideas? 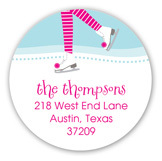 Check out our Polka Dotted Roller Skating birthday invitations for girl section of our site. The skating rink is so inspiring with the lights and groovy carpet. Just add some special decorating touches. You can spray paint canvas baby shoes and round wooden dowels from your local hobby store. Then decorate them with buttons and glitter, and placed them on top of the cake. A simple party favor can be Skittle filled bottles. Spray the lids with metallic gold and roll it in glitter. Roller skate shaped rice krispie treats with neon sprinkles is easily one of our favorite things. For party favors, send the kids home with neon shoelaces and boxes filled with neon sour gummy worms.. yum! Each table can be sprinkled with store bought neon confetti to complete the groovy look. 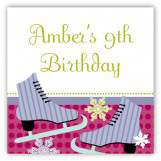 If you want birthday invitations with picture, use our Grab Your Skates Photo Card. 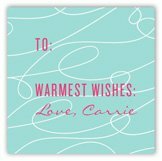 It's a great choice for milestone birthday invitations. 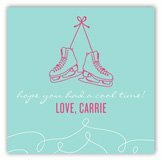 It will help you create a sweet skating party theme. This is perfect for winter weather with all the rain and cold weather, it's fun to bring it indoors. The absolute perfect way to warm up, supply your guest with a cozy hot cocoa bar. Let your guests top their cup with pink peppermint mallows, French vanilla mallows, mini chocolate chips, and whipped cream. You can use peppermint sticks and hazelnut piroulines as stir sticks. You can make the cutest little penguin cake pops with some simple rosey cheeks and winter hats. Don't forget to make glittery pink snowflake cookies with snowy, frosty details! You can bring the outdoors in with snowflake decorations, frosty treats and a fun snowman game (wrap each other in toilet paper and whoever looks like a snow man first wins)! Winter Wonderland games are a must. If you are having trouble making the space look cute, don't worry. You can make a table runner with printed fabric and layer it on top of an icy blue and a white tablecloth. Then, cut out snowflakes and glitter them with super fine and sparkly glitter. Just glue each of the snowflakes to baker's twine and hang them. You can also use them for placemats to make the tables seems more special. But your guests probably won't even notice, they will just be so excited to have an outing that is indoors and nostalgic. It brings all of us back to our younger days which is so fun to share with our own kids. 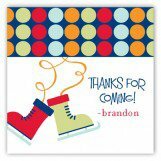 Honestly, the best part of this type of party is seeing everyone having a blast on the rink. Something about lacing up a pair of skates that brings out the kid in everyone. It is such a blast! We recommend taking your next party to the rink. Now let's return to an all skate!